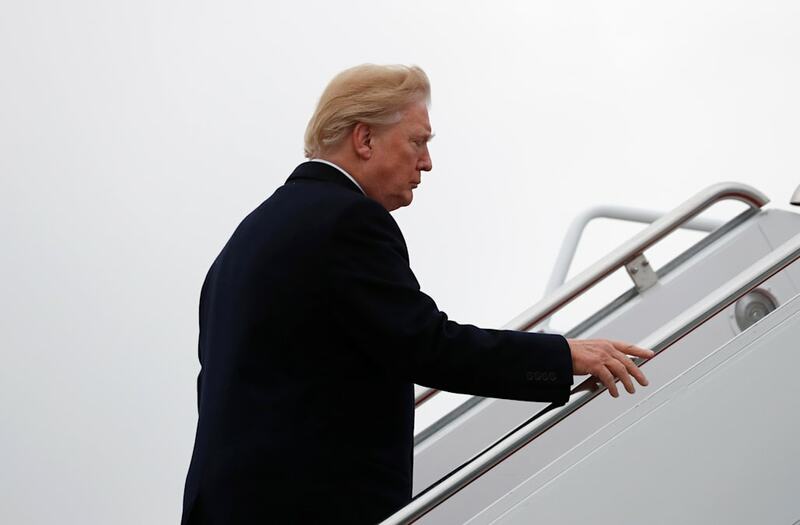 President Donald Trump reportedly erupted at his staff aboard Air Force One after learning that a Department of Justice official warned against releasing a controversial and classified memo authored by Rep. Devin Nunes. Trump, together with Attorney General Jeff Sessions and White House chief of staff John Kelly, reportedly spoke to officials and staffers about the DOJ's performance. The reported outburst follows a pattern in which Trump has been increasingly involved in internal DOJ and FBI operations. On his flight back to the US from the World Economic Forum in Davos, Switzerland, President Donald Trump erupted in anger at his staff after learning that Associate Attorney General Stephen Boyd had warned that it would be “extraordinarily reckless” to release a classified House Intelligence Committee memo written by Rep. Devin Nunes,, according to Bloomberg. The memo in question details allegations that the special counsel investigation into Russian election interference has been mishandled by the Department of Justice (DOJ) and the FBI. Trump has repeatedly called for the memo's release, likely in the hope that it would vindicate his belief that the multiple probes being conducted are a partisan "witch hunt" — a claim Trump has made on multiple occasions. U.S. President Donald Trump and first lady Melania Trump wave before boarding Air Force One at Leonardo da Vinci-Fiumicino Airport in Rome, Italy, May 24, 2017. REUTERS/Alberto Lingria FOR EDITORIAL USE ONLY. Bloomberg's sources also noted that Trump and his chief of staff John Kelly had spoken personally to Attorney General Jeff Sessions and other members of his staff, with Trump himself telling Sessions that he should do his job as well as could or risk being seen as a failure. Trump has reportedly been more and more frustrated by the DOJ's inability to do his bidding in recent months, and on one occasion last week asked why he couldn't get "[his guys]" and the "Trump Justice Department" to do what he tells them to do. Trump's heavy-handed involvement in the affairs of the DOJ and FBI has led several high-ranking members of the organizations to threaten to resign, and the FBI's deputy director, Andre McCabe, stepped down on Monday after months of pressure from Trump, who reportedly told FBI Director Christopher Wray to remove him. McCabe had previously been the subject of a string of tweets sent by Trump that referenced his wife, his impending retirement, and his alleged connections to former 2016 Democratic candidate Hillary Clinton.